My favorite season of all has arrived. Cool weather, perfect to be outside and falling leaves in that yellow color that I adore. 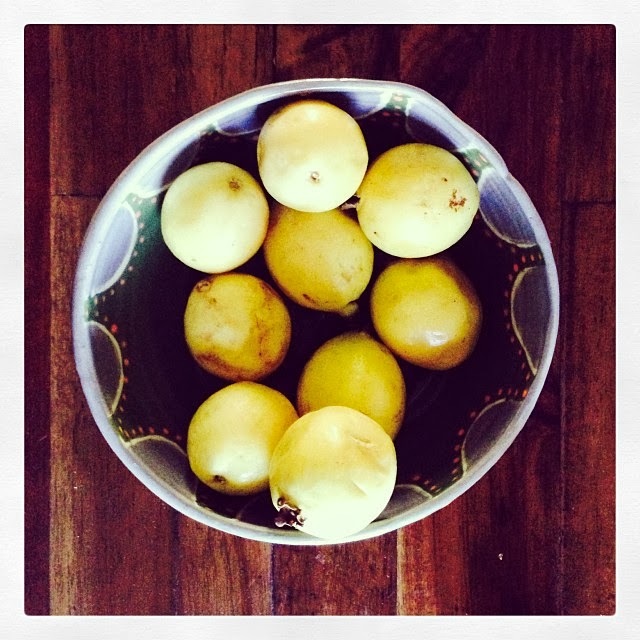 And when I go inside my home the perfect smell of guavas is lingering in the dining room and that's just bliss. There are two foods I will never say not to: Chocolate and guavas. Once I even found chocolate covered guavas. That was one of the happiest moments of my life! I just love guavas. Guava anything. And my son does too. Which reminds me of the true intention of this post that was to share something else... but I'm like that, my mind skips from one topic to another totally unrelated one from one second to another. I don't know if I mentioned it but I took my son out of school this year and he's with me at home all the time. I don't have anyone who can help me care for him during the day, so we basically spend all of day together... which leaves me with ZERO time to work during the day. He's fine if I'm in the computer but as soon as I try to work on something he wants to help (by helping I mean he wants to do what I'm doing or grabs stuff and runs away with it because he finds it very funny) or wants to do something by himself and ask for lots of help so I end up doing nothing until he's asleep. Which is about 9 pm. I used to do that when my daughter was his age and I was younger and it wasn't a problem, I could handle it better. But with 2 kids, a husband, a house and a nighttime shift as an artist sometimes I just crash out. Like yesterday I laid down with my son so he could fall asleep and I woke up this morning. Mr. Danita said he tried to wake me up but couldn't and I don't even remember hearing him or anything, it's like I just passed out. Sometimes I wonder how much longer I will be able to keep working like this. And then I remind myself that it's only a year until he goes back to school again and I'll have the mornings free and I could work in the mornings then. Meanwhile I just need to work smarter. Just breathe and do the best I can with what I have right now. Just that. Kids grow up really fast....before you know it they will be leaving the nest...enjoy! You may want to set a few boundaries so there is some productive time on your side! I love guava pastry from our local grocery! Blessings! I know! My little man is 14 months and I don't get much done either. I'm just trying to relax and enjoy him though, and just do little bursts of art here and there when the opportunity arises!!! I know they grow so fast! That's my predicament! I wish I was more time with them and at the same time I wish I could have more time to work! But I think that's the life of the mother's! Never enough time to do all you want! Just breathe is the best advice. Love your art and I get it about juggling it around the family. Ohhhhmmmm. It does get easier as they get older. I can't help but wonder why you would take your son out of school?